Va. Fence Law: Who's Actually Responsible for the Cost of My Fence? As the weather warms, Virginian's are beginning to make their outdoor wishlists. If you're thinking of installing an above or in-ground swimming pool or trying your hand at urban or rural farming, the majority of the information in this article will greatly help you in understanding the ordinances, cost and responsibilities surrounding your 2014 outdoor projects. And—you might have to spend less than you think. History & Psychology CH. 2: Where did the perimeter fence come from? As the great English agriculturist Arthur Young said commenting on eighteenth century French peasants’ toil on their small patrimonies, “Give a man the secure possession of a bleak rock and he will turn it into a garden. Give him a nine years' lease of a garden and he will convert it into a desert." Being instrumental in the culture of property, the fence fostered long-term thinking and constructive effort. 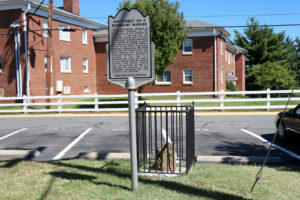 The 1st Monument: Iron Fence preserves America's earliest history.